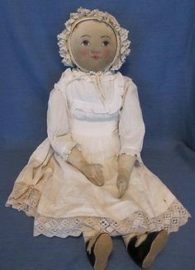 Back by popular demand, Taylor Community Resident Kit Peterson, an antique doll aficionado, and her equally knowledgeable friend Peg Farwell, present a discussion about the history and identification of cloth dolls. The event is scheduled for Wednesday, April 3 at 2 p.m. in Taylor’s Woodside Building. The free event is open to the public and people are invited to bring along any cloth dolls they may have in their collections.